Join Color Evolution to build color competencies and sharpen your visual literacy by exploring the 21st century color field, where we navigate dense networks of color codes every day of our lives. As an artist, designer, color mentor and color advocate, I am proposing to host an interdisciplinary Color Workshop to explore 21st Century Color, the re-mapped color field, where dots between disciplines are connected. As a component of light and a mental construct, color can no longer be dismissed as "merely decorative". 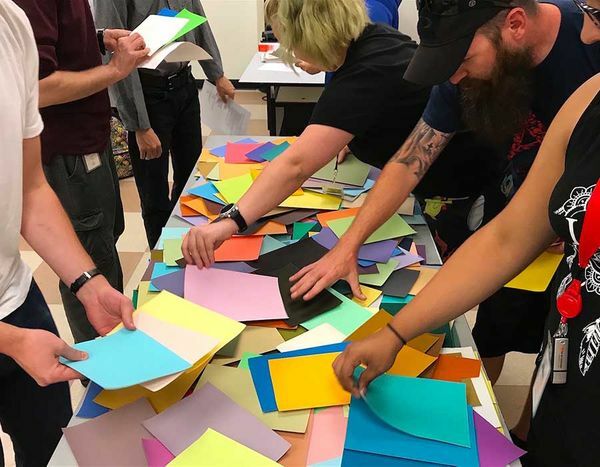 This interactive workshop (a variation of the workshops I give to diverse professional and community audiences) is designed for Austin Design Week's timely "Open Doors" theme. begin to crack the cultural color codes coursing through our lives every day. Various visual aids will be integrated to prompt dynamic engagement with participants. No paint mixing is involved, as it is vital to realize that color is SO much more than paint. Luanne Stovall has an MFA from Tufts University and is a lecturer at the UT School of Architecture and the College of Fine Arts. Luanne has given color lectures, workshops, and courses in many locations including the University of Texas, Austin; Wellesley College; School of the Museum of Fine Arts, Boston; Sloan School of Business, MIT; and The Contemporary Austin. Currently, she is writing a multidisciplinary 21st Century Field Guide to Color and developing the Hero’s Journey Capsule Collection for a spring 2019 Pop-Up Gallery. Her paintings are in public and private collections including the Blanton Museum of Art; San Antonio Museum of Art, Art Museum of South Texas, Corpus Christi; El Paso Museum of Art; and Neiman Marcus Signature Store in Boston.